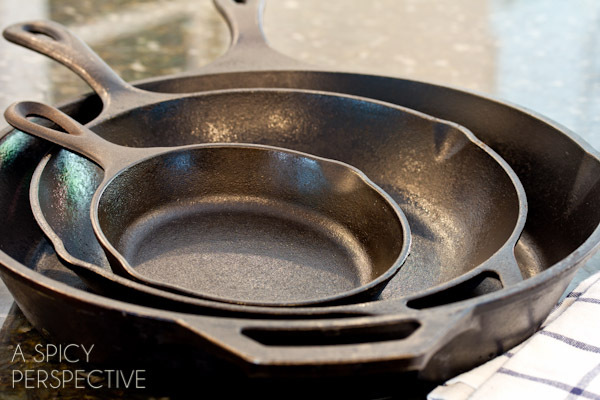 Learn How to Clean a Cast Iron Skillet, the easy way. And maybe a little lesson on how to season a cast iron skillet as well! I get a lot of questions about cooking with and cleaning cast iron. Maybe it’s because I live in the Carolinas. I will say, my cast iron skillets do have a much better season going on than they did before we moved here. Families in the south pass on well-seasoned cast iron like a precious heirloom. So I’d like to clear up a few misconceptions about cast iron. The first thing to know about cast iron skillets is that they must be “seasoned” in order to cook as a nonstick surface. The seasoning is a protective nonstick layer sealing the iron. This layer is developed over time by the microscopic pores in the iron absorbing fats. In order the keep the season you must never wash a cast iron skillet with dish soap, which is a degreaser. If you do, you strip away the protective coating, which will cause your skillet to rust. Let’s first talk about how to season a cast iron skillet, and then I’ll go into how to clean a cast iron skillet so you don’t lose your seasoning. Most cast iron skillets you buy now days are sold as “pre-seasoned” but I always season them anyway, just to be sure. I’ll save my soapbox message on false advertising. 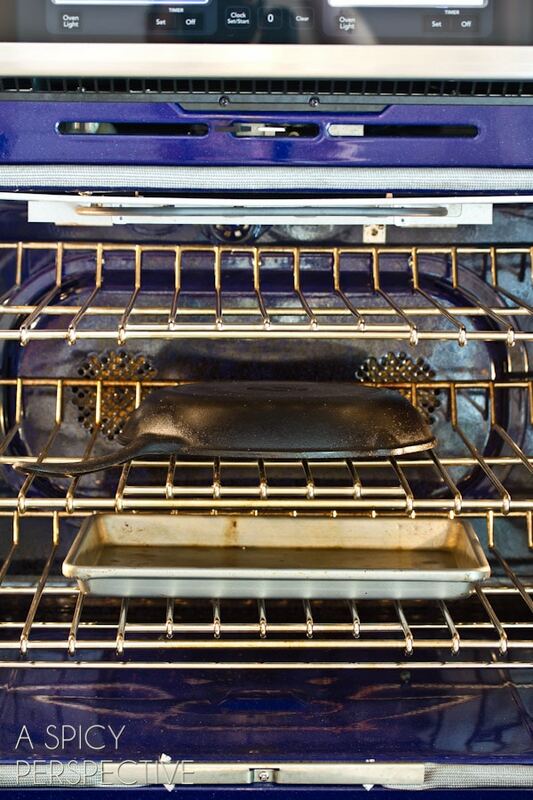 Preheat the oven to 350 degrees F. Place a rimmed baking sheet on the bottom rack. Then rub the skillet’s interior with a generous layer of vegetable shortening. Place the skillet on the middle oven rack up-side-down over the baking sheet. Bake the skillet for approximately 2 hours. The pores in the iron will open and absorb the shortening, and the excess will drip down off the baking sheet. After 2 hours, turn off the oven and allow the skillet to cool to room temperature in the oven. You should do this to new, or newly acquired, cast iron skillets and again anytime your seasoning seems to be wearing off, i.e. when the babysitter puts your cast iron skillet in the dishwasher!! If you care for your cast iron skillets properly after you’ve seasoned them… you may never have to season them again. Through cooking and proper cleaning, the seasoning will improve over time. 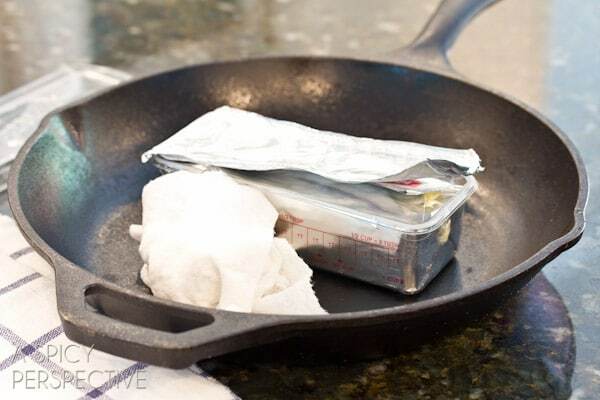 So now that you have a newly seasoned skillet, how should you clean it? And a little bit of fresh water if needed. Place a spoonful of salt in your dirty skillet. Pour an equal amount of cooking oil over the salt. 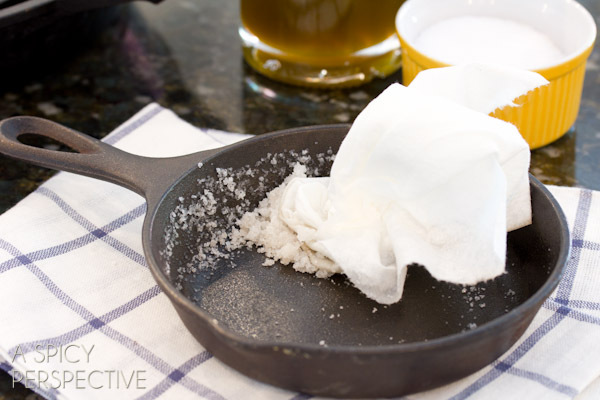 Using a paper towel, rub the salt-paste over the skillet in a circular motion to loosen debris. 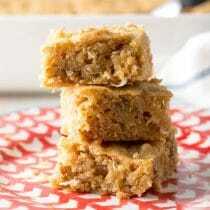 If the food is really caked on, use a flat metal spatula to scrape it off. 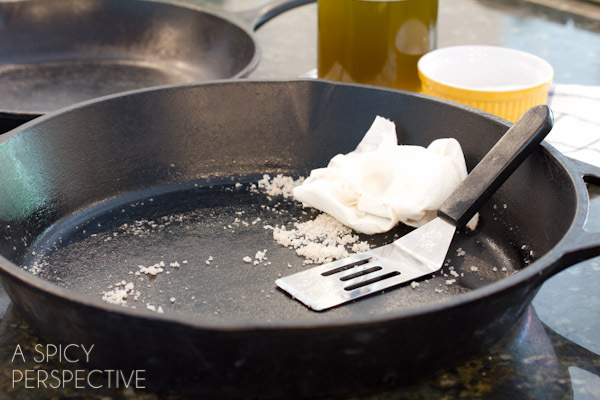 Then… and this is important… wipe the salt out of the skillet and wipe out any excess oil. The oil not only helps loosen the crud, it adds a little more “seasoning” to the skillet every time you clean it. 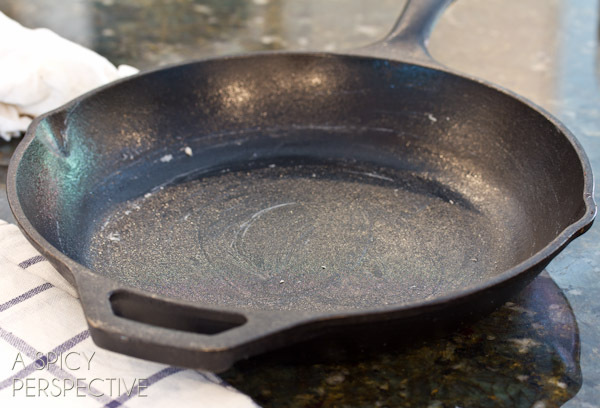 If you happened to overkill on the salt (or burnt something in your skillet and have a TON of debris) you can rinse your cast iron skillet with fresh water and dry thoroughly. Then you’ll need to rub the skillet again with oil to make sure you’ve added that thin layer of seasoning. I can feel some of you out there brooding over germs. Yep, I’m talking to you… You want to add a drop of dish soap to your skillet when no one is looking. Did you know salt is antibacterial? And remember, this is a tool that gets heated to scalding temperatures day after day. Germs are not an issue here, I promise. As long as you remove the debris with salt and rub the skillet with oil, each time you use it, your seasoned cast iron should just keep getting better and better with age! These are some great and very helpful tips. I just got few cast iron pots from my mother along with some instructions how to clean them, but I’m not into that stuff and decided to find some more ideas. Your tips on keeping cast iron pots in a proper condition seem to work perfectly for me and I’ll definitely keep them on mind for after my next cooking. I’ll recommend your post to my sister too. Thank you for sharing! The way to clean & season cast iron is very helpful but I’ve inherited a cast iron skilled & flat bottomed pot both are partially rusted. How do I clean the rust off before I even think of seasoning. I live on the coast in South Africa cause of the rust. 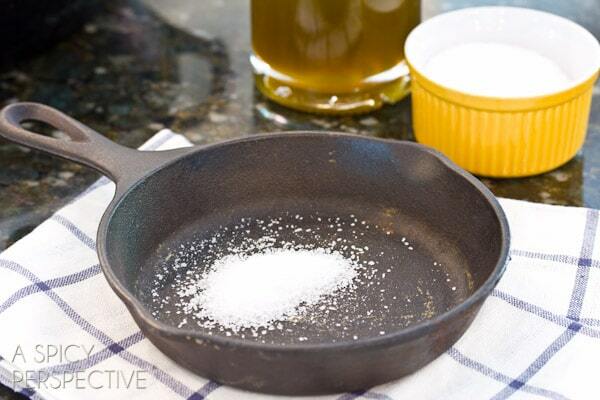 Rubbing your cast iron skillet down with salt and oil is a fantastic idea. I am going to follow your advices. I always hate cleaning my skillets. It was like a nightmare for me. I hope with your help it will be easier. Best regards! Would it be okay to use bacon fat to re-season my pans? I happen to have that on hand and I don’t have any lard. OMG!!! So easy way to clean my iron skillet! Thank you so much for sharing so incredible way of cleaning! Keep going with the amazing advices!Edmonton Carpet Cleaners Ltd.
I’ve had a cast iron skillet since college. I never knew how to season or clean it properly. (I’m talking YEARS before the internet.) Last year, after many years of disuse and ridges of rust, I was ready to throw out my pan. I decided to give it one last shot, figuring I had nothing to lose, since I was ready to get rid of it. I placed the cast iron pan in my self-cleaning oven when I ran that cycle. I only recommend it if it’s beyond saving by more conventional means. The result was all the rust was gone; all the finish was gone–just down to bare cast iron; but I had a clean, smooth pan. I’ve since reasoned it (had to do it 2x) and maintained it following instructions here. Thank you for the salt scrubbing tip. It’s fabulous! I will think about salt. i used to just burn of my scraps and scrape witha putty knife but then I got a fancy alarm system that brought the fire dept. so now I put water in the bottom, get it very hot and then scrape with the putty knife and let it cool a tad and dump hot water into sink with the cold water running. Then rub some oil on pan when cold. Is it safe to put the cast iron pans in the oven when they have wooden handles? Hi Anne! Hmmm…. I don’t think I would try it, but I don’t know for sure. Sorry! I recently bought a Lodge pre-seasoned cast iron skillet. After seasoning it and using it, I’ve been wiping it out and then adding a thin layer of vegetable oil and putting it in a warm oven. However, the inside of the pan is sticky rather than smooth as everyone else has stated it should be. What do I need to do to get it right?? All suggestions are welcome! i was having the same problem. try using a more solid fat (crisco, lard, coconut oil) and turning up the heat of the oven. coconut oil at 400 for an hour worked for me – let the pan sit in the oven after you turn it off. i turned out a perfect pan of cornbread for thanksgiving after seasoning it that way. it’s very smooth now. My grandmother has a set of cast iron that’s been somewhat neglected over the years. It’s at least 20 years old and I wanna restore it. She seasons it but she also uses soap to clean it to “kill the germs and bacteria” as she says. I’ve tried to point out to her that that’s part of the reason it’s rusting, but she won’t listen. She also just let’s it air dry with water still on it in the dish drainer in the sink. I’m seasoning the cast iron as I do like using it to cook but it’s not as seasoned as it should be due to her negligence over the years. I prefer the cast iron to the stainless steel ones she has, actually. I don’t know what I can do to keep it looking good and keep it functional short of seasoning it after she cooks with it, which is everyday. To save time putting the shortening on it, can it be melted in the microwave then brushed on or will that be just like putting liquid vegetable oil on it? She has this big roasting pan that is very difficult to season properly due to it’s size and the handles. Any tips on how to make seasoning that particular piece of cast iron, and the rest for it for that matter, slightly easier and less time consuming? I love this set as it really functions well when it’s kept up. I don’t know how to get through to my grandmother to start taking care of it better. This piece of writing is truly a nice one it assists new internet visitors, who are wishing in favor of blogging. I have tried frying eggs in my cast iron skillet. They ALWAYS stick to the bottom and burn.Is this because I don’t have the skillet seasoned enough, or seasoned wrong? I have three cast iron skillets, that I never use because EVERYTHING sticks. What exactly am I doing wrong? All help is appreciated. Would you recommend cleaning the cast iron after it cools down after use, or when it is still hot? Great article, I have ruined 3 cast iron skillets, not knowing how to clean them. Using detergent and water, tried Coca Cola in the oven all the tales I’ve been given, but nothing like your instructions, I will definitely be getting another and will follow your instructions to the letter, even if it say pre-treated. I have a cast iron grill pan. I have quite a buildup of crud that is building up between the grill ridges that create the grill marks on the food. Only use for cooking salmon in the oven. Any suggestions on getting this heavy buildup out of the bottom of the pan. THanks. The last time someone commented was 2013 I hope you still check this site!!! When I cook with my cast iron skillet, the food leaves a thick layer of gunk on the bottom of the pan. Some say clean it immediately after cooking. But I’d like to eat my dinner before it gets cold! How can I easily remove that nights dinner of left over gunk, after I eat? It seems hard as a rock when I’m done cooking. Thank You! Deb, try soaking it for a few minutes in JUST water, then use a flat metal spatula to scrape off the gunk. THEN clean as instructed above. When your ready to clean the pan, just re-heat it with all the gunk in it. Then when it’s nice and hot (5 min) add water and scrub with a handled dish scrubber. Be careful not to get scalded. Steam cleaning works great. Then salt clean, heat dry and re-oil. I have looked online for various ways to clean my cast iron skillet in the past and have never felt like it was really clean afterwards (the salt!!! Big ole kosher salt for abrasion! Genius!!). My skillet was gross enough that I turned tons of paper towels black and shredded them to pieces (I had serious scrubbing to do), then I read the comments and decided to try a dish rag – worked like magic!!! 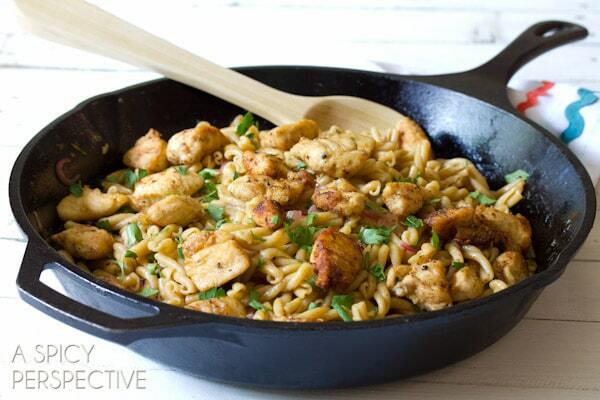 I’ve always cooked spicy/savory dishes in my cast iron skillet. 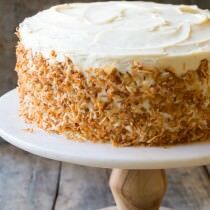 It seems to retain the onion/garlic/spicy flavors a bit which hasn’t been an issue until now that I’ve come across a dessert recipe i’d love to try. is there a way to remove these flavors or do i need 2 skillets, 1 for savory and 1 for sweet dishes ? Hi Alison, the salt scrub should help remove the flavor. i’ve worked and worked with oven cleaner, metal brushes, steel wool, straight razor sacrapers, and the like. i have 5 skillets and a dutch oven with zero “removable” cooking debris, and i still get a dirty towel when i wipe them down to set up curing procedure. the patina is a dull dark grey for the most part…lovely to look at, but still dirty. what’s going on? please help me. Love this tutorial! I have one question though. I don’t use paper towels, would I just rinse it? Is there another alternative? 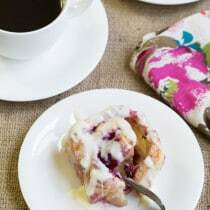 Pingback: Friday Things | Best Recipes! I am seventy nine and the only skillets my mother had were different sizes of the iron skillet and used them three times a day. We had to wash dishes and always washed them in the dishwater at the end and never knew about seasoning. they were always slick in the bottom and I have some of them now. Never knew of them rusting. Have bought some of them in later years and had trouble with rusting and sticking. My dad bought one of the iron dutch ovens and cooked beans in it and they turned black and you can imagine what happened to that. Also heard a doctor’s wife say that cooking in the iron skillets was so much healthier than thes newer coated skillets. Am using a large skillet now that burns and sticks to the food but will try to use your remedies to correct that. I’m now Happy Happy Happy!! I have my large cast iron skillet and it’s one more MESS! My son got hold of it and he never does dishes, except this time.. and ruined it! Now I know how to clean all the gunk out of it! I’ve tried everything from oil to Scotchbrite.. the HEAVY stuff.. this all stands to reason! Now. when I finish getting all the crud out, should I re season it the way it should have been seasoned in the first place? My Grandmother used to season her new cast iron by cooking Salt Fat Back in it and then just wiping it out…..I have never ever seen her have a problem with any of her skillets after doing this. She just always used to cook her salt fat back in the cast iron skillets. I suppose I will give it a try! It sure can’t hurt it! Thank you so much for the tip!! 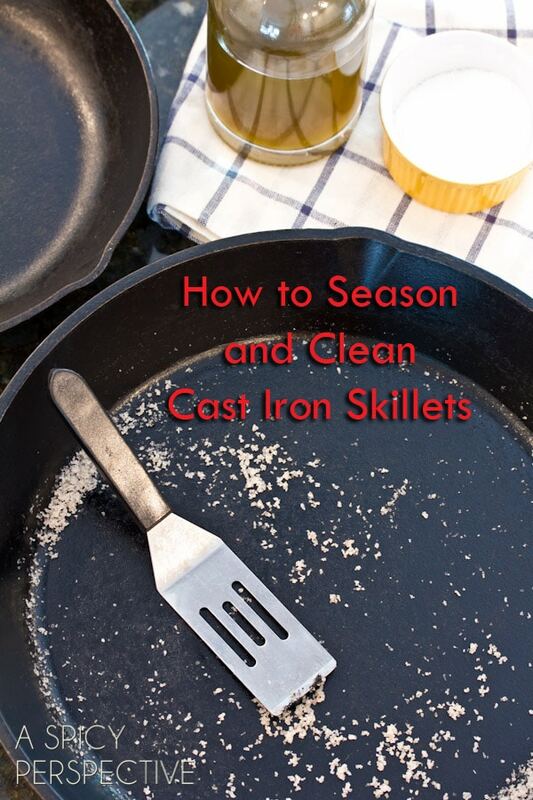 Do you clean the cast iron skillet every time you use it? I’m thinking about getting a cast iron skillet and the cleaning process seems somewhat complicated, I wouldn’t want to have to do it every time. Hi Gibson, You do need to rub it with salt and oil every time to keep/improve the seasoning, but it’s worth it! I just bought 5 preseasoned cast irons pans for Lodge. Thank you for the information, I just rec’d them so they had their first wash with soap and water BUT no more. Have a question, I’ve heard not to use metal spatulas etc on these pans, but I see people on the Food Network using them. You know, I think some people are worried they are going to scratch their seasoning off, but I still use them. As long as you’re not too rough on your skillets, it should be ok.
Can I save a cast iron skillet that has some rust inside on the cooking surface. It was given to me and I would really like to try and save it. Its not thick rust just a few spots on the surface but I’m not sure if I should use it or not. Thank you for the information, BUT, MY QUESTION IS, I obviously have been mistreating my cast iron griddle because I wash it with dawn every now and then and now I am having a problem with black flakes coming off onto my food. I was wondering if you know how to get the flakes off the griddle. It’s like it’s chipping off around the edges. Any info would be great. My mother showed me how to clean stuff burned in a iron skillet..we were cooking sliced apples with a lot of sugar to carmalized them,,,soooooooo good…but the skillet was a mess…she put just a spot of soap in skillet with about an inch of water and brought to a boil until it all turns loose and smooth and clean…then she seasoned it afterward…it is a lot easier then trying to scrape it off. This is great so glad I came across it… Curious if you or anyone has ever tried it on a cast iron grill pan and if its same process just longer due to the grates? I haven’t read through all the comments yet so I’m not sure if this has been addressed yet. Would coconut oil be OK to use to season? Or even to clean along with the salt? THANKS SO MUCH FOR YOUR HELP! I bought another cast iron skillet (smaller than the first) because I liked the first one so much. I will season it with coconut oil! 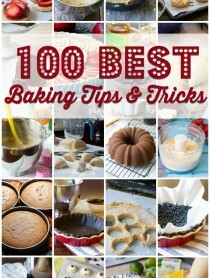 Pingback: Stuff I’ve Gotta Share and You’ve Gotta See | Easiest recipes in the world! 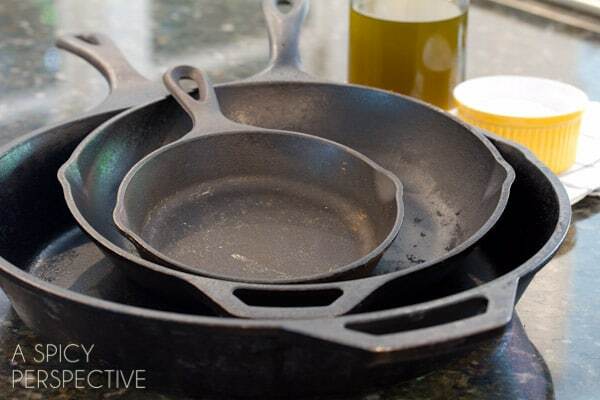 If you use water to clean it, put the cast iron in the oven before putting more oil on it. This way you don’t lock the water in with the oil because oil rises and the water will be sitting on the cast iron. You want it to be completely dry before adding oil. Do you find that Kosher salt or regular salt works better, or does it not make a difference? Thank you. I’ve used the salt trick many times but this is the first I’ve seen on using it WITH oil. Thanks for sharing! My cast iron skillet is showing rust spots. How do I get rid of them? Cooking with cast iron is my favorite. Great tips! This is a great posting! I grew up with cast iron and it was the first thing my mom bought for my own kitchen when i moved out. I’ve had “help” (I.e. husband) ruining nonstick skillets right and left for the last 10 years. I put them away before he could do more damage and got the iron back out…he won’t touch it and that’s ok! Iron skillets were cleaned with sand and water, if you had it, on the frontier, so it stands to reason salt would work…will have to try this next time I use mine. My mom always preached about cast iron skillets :-) She made the most perfect corn bread in a small one. I never knew you could season one yourself– I just thought someone had to GIVE you a good one. Great to know this–Fantastic post! Another tip I was given for cast iron skillets – you can remove rust on the pan by using a cut half of a raw potato. Just rub the potato over surface of the skillet. It did work for me. That’s awesome! Thanks for sharing!! 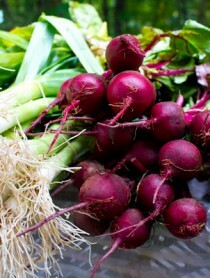 There was a recent blog entry on The Kitchn addressing the same subject. They stated to rub away rust on your cast iron with a raw potato and either dish soap or baking soda. I did the raw potato and baking soda and it works!!! In our discussion of cast iron cleaning, we mentioned that you can rub rust away using a raw potato. This tip is so unusual, yet handy (and non-toxic! ), that we thought it deserved its own spotlight. And the potato trick isn’t limited to cast iron – you can use it to remove rust from baking pans, knives, and other household tools. To clean rust with a potato, cut it in half lengthwise or crosswise, depending on how large a surface area you want. Dip the cut end in dish soap or baking soda and firmly rub it over the rusted area. If the end of the potato gets slick, slice it off and apply more soap or abrasive. Repeat until rust is removed, rinse, and dry. Great tutorial, and so helpful! I always wash mine with dawn dish washing liquid to disinfect all of the food gunk, then I rinse, dry and spray cooking spray on it and rub it around with a paper towel. It turns out fine! I never have any rust or anything, mine looks great! Such a great post and so many helpful tips! Thank you! Love this article! So so important with cast iron! Thanks! this is great information as i love my skillet and now I know how to keep it in good shape. Thanks for this article. I think this should be given to all with a purchase of a cast iron skillet and to newly married couples. It would help them tremendously. This is just what I’ve been looking for! I live in the UK and saw a special offer on a Lodge Skillet (yet to use…!) but I have noticed on many blogs that people also use their skillet for sweet dishes – do you keep one pan for sweet and another for savoury – if not does the savoury food ‘taint’ the sweet food? Love your blog. Wonderful post and great tips. My grandmom used cast irons a lot and she passed on some to me and I am so scared of using them, don’t wanna rust them up. Your tips will help to keep them as they are. Thanks. Thanks for the great info. I know a lot of people have different ways of cleaning and seasoning, but your methods are dead on to what I have discovered worked best for me. 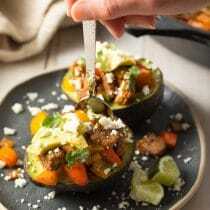 I am passing a link on to this from Cast Iron Cookware page on Facebook! 1. Can one use oil instead of shortening? We live in India and it is not easy to find . Plus since I don’t cook with it, I will be stick with the excess. If yes, which oil? 2. I mostly cook for my family of four. If I want to start off by owning a single cast iron skillet, what size would you recommend? 3. Does the oily layer get rancid if you don’t use it the skillet for some time? 1. You can use oil to season the skillet, but you may need to season it more than once. I would not turn t up-side-down if you use oil. If you eat meat and aren’t opposed to animal fat, you could use lard or tallow, because its thick and you can apply a thick coating. 2. My favorite cast iron piece is a big 14 inch skillet that’s great for large one-pot dishes. Thank you! Thank you! Thank you! I had been wanting a cast iron pan and received one as a gift. It turned out to be preseasoned, and I wasn’t sure what that meant. Research told me to season it anyway. I ended up confused and afraid and the pan has just been sitting there. You have made the whole procedure and the reasons why perfectly clear. The next time I cook it will be with my newly seasoned cast iron skilet. I will think of you and be grateful every time I use it. I love my cast irons and I used to THROW them when rusty because I didn’t know how to clean them properly. Great tips! This is such a great resource! PInning this for sure! This is awesome. Thanks so much Sommer!! I love your “how to” series, Sommer, and this one is no exception. Great tips! In my younger days, I ruined one by washing it. The genius that I was, I thought putting it onto the fire would help the moisture evaporate. Now, I’m lucky Dad taught me how to keep them clean w oil & salt. I have gone through two cast iron skillets because people keep washing them! I’ll have to print out this post and hang on the fridge. awesome advice…i have a pan i have been useing 20 plus years and it has a black hard crusty stuff on the bottom and around it..i use a gas stove.. how do i get rid of it? I have the exact problem. Nicely seasoned on the inside, but tons of crud on the bottom. How do you get rid of it? I would give the outside a thorough scrub down with oil and salt and seasoning the top AND bottom by rubbing the entire skillet with shortening and following the same process. Let me know how it goes! The secret of …. such an important lesson. Thanks for the great “how to” Sommer! My cast iron skillet is in need of some serious love- this post was perfectly timed! Thanks! 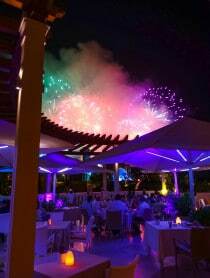 Thank you Sommer! I needed this badly. I love this post!! I’m so glad you wrote out all these awesome tips to caring for cast iron. I’m going to pull mine out and reseason it this week. Perfect inspiration! I usually use veg oil to season my cast iron skillet, but I like the idea of the shortening. I have a small tub in my cupboard that I usually only use during the holiday season (to make Paula Deen cookies). Now I can use it throughout the year! I LOVE my cast iron pan. I leave it on my stove top and use it all the time. Thanks for the how-to! Thanks for the helpful and useful tips, Sommer! If I want my cast iron to last a lifetime, I have to take better care of it! Great post. Thank you. I actually really needed this tutorial Sommer! Thank you! I’ve been struggling with mine. Something always seems to stick. I haven’t used soap but I’ve used water. I apprecaite the tips! Yep exactly the way my Mom taught me with grapeseed oil and salt. Such a great how to!! Thank you for this! Great how-to!! I love my skillets and can remember my mother threatening bodily harm to anyone who ever even thought of suggesting to wash her’s with soap!! I’ve never used the salt/oil method but I must try it!! 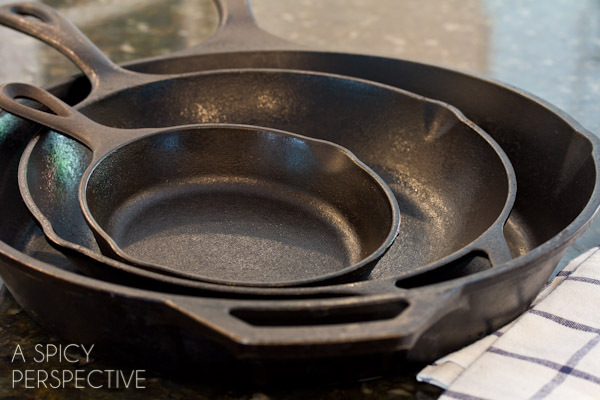 I have something to add to your post… great post by the way, because most people don’t know how to care for their cast iron skillets. If you do need to use water.. you should turn place your skillet in the oven at 400 degrees for 5 -10 minutes or heat it up very well on the stove top for 15 minutes before you re-oil the skillet. That way it dries out thoroughly. My mom always did this when she had to use water to wash a skillet and her’s always looked wonderful because she made sure she dried them completely. Thank you! I don’t have much experience with cast iron, although I do have a pan and I’ve used it a few times. I’ve definitely broken some rules, and the tip about salt is incredibly useful!! I feel more confident now using and cleaning (and maintaining) my cast iron now. Thanks so much!! You know I needed this post. I know nothing about cast iron skillets and I have a little collection (collecting dust) in my cabinet! You have inspired me to pull them out! Well maybe just one. :) Great great post. Fabulous how-to post, Sommer! Great tips and very thorough with the seasoning and cleaning methods. It’s really sort of like the OCM (oil cleansing method) for our facial skin and pores with natural antibacterial ingredients. Thanks for sharing! Pinning! I do this with my flat-bottom skillets, but how do you do it with a ribbed-bottom skillet? (The kind that keeps the meat away from sitting in the fat when you grill it) It always takes me forever to clean this one, and I love using it.